It has a broader spectrum of activity than fluconazole. It is an azole antifungal medication used to treat a variety of fungal infections. 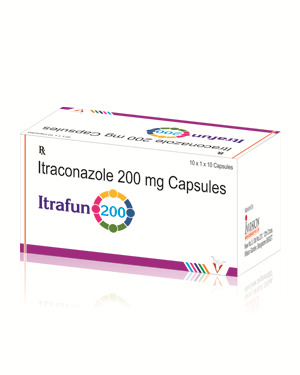 Itraconazole capsules are used to treat fungal infections in the lungs that can spread through out the body. It is also used to treat fungal infections of the fingernails. This drug may also be used to prevent certain fungal infections in patients with HIV. It is in a class of antifungals called triazoles.It works by slowing the growth of fungi that cause infection.